Cook rice according to package directions, omitting salt and fat. Drain; cover and keep warm. Cut steak diagonally across grain into 1/4-inch-thick slices. Combine steak and hoisin in a bowl; toss to coat. Thread steak onto each of 8 (8-inch) skewers; sprinkle evenly with salt. Place skewers on a broiler pan coated with cooking spray; broil 3 minutes on each side or until desired degree of doneness. Sprinkle skewers with cilantro. Combine coconut milk and remaining ingredients in a bowl, stirring until smooth. 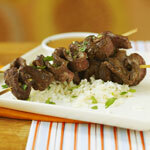 Serve with skewers and rice.